This month's ingredients were pretzels and mustard. Fun summertime ingredients! Makes me think of baseball games. I decided to try something I've never done before: make a pretzel dough from scratch. 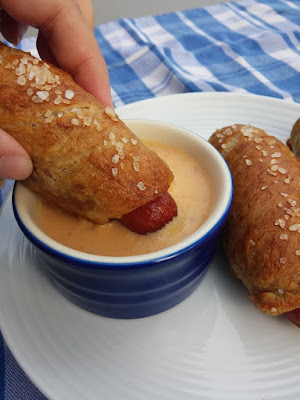 I had seen lots of recipes for Pretzel Dogs around and thought that would be fun to try. I went with the method from The Slow Roasted Italian, because hers just looked a lot simpler than the others and there was no rising time. 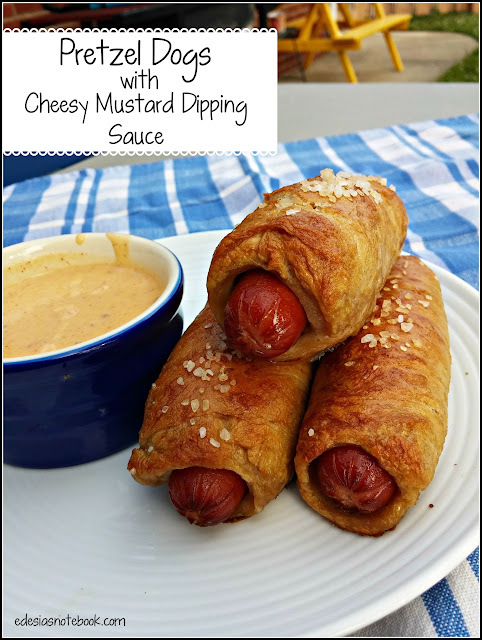 Instead of regular mustard, or even honey mustard, I got creative and made a cheesy mustard sauce to dip our dogs in. Preheat oven to 450°. Put a large pot of water on to boil. Combine the beer, honey, and yeast in a large mixing bowl and stir well. Wait a few minutes for the yeast to “bloom”, then add the salt and the flour. Mix well. Turn dough out onto a floured surface and knead for about 3 minutes, adding more flour if necessary. Dough should be somewhat tacky, but not so sticky that it sticks to your fingers. Cut dough into 12 equal-sized portions. Roll each portion out like a snake, about 10” long. Slightly flatten it. Starting at one end, carefully wrap the dough around the hot dog, making sure the edges touch as it goes around. You can leave the ends of the hot dog peeking out, though. Pinch the ends of the dough to the rest of the dough to keep it in place. Take the pretzel dog and roll it a few times in between your palms to smooth out the dough. This just makes them slightly prettier. Repeat this process with the remaining dough and hot dogs. When water is boiling, carefully add the baking soda. Be careful; it will bubble up! Add two pretzel dogs at a time to the boiling water. Boil for 30 seconds, then remove with a slotted spoon (I used a spider). Once all the pretzel dogs have been boiled, place them on a baking sheet. Whisk together the egg and the water and brush this mixture over the top of each pretzel dog. Sprinkle generously with coarse salt. Bake in the preheated oven for about 15 minutes, or until they are dark golden brown. (Make dipping sauce while they are baking.) Serve with dipping sauce. In a small saucepan, melt butter. Add flour and cook a couple of minutes. Stir in smoked paprika and mustard. Slowly add the milk, whisking constantly. Increase heat to a simmer. When it starts to thicken, decrease heat to low and stir in the cheese. Taste for seasoning, adding more mustard or cheese if desired. Makes 6 servings, 2 pretzel dogs each. Yum! These were so good! My husband and 5- and 7-year-old daughters loved them. And the sauce was perfect! Cheese and mustard work really well together. I just used 1 tbsp of mustard because I didn't want it too spicy for my kids. But if you are a mustard lover, you might want to use more. 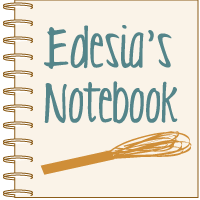 Be sure to check out all the other great pretzel and mustard recipes below and come back next month to see what I make with tomatoes and herbs. Your sauce sounds soooooo delicious! Great choice! Oh my! You not only made a cheese sauce with mustard, you went & put SMOKED PAPRIKA in it! That is a real favorite around here. :) I am totally obsessed with Penzeys Smoked Spanish Paprika. I put it in everything! I definitely always put it in cheese sauces because not only does it give a nice flavor in the background, but it gives the sauce a nice color boost.